Goldcorp is committed to making a positive difference in the communities where it operates. The company's goal is to leave a legacy of long-term social, environmental and economic benefits everywhere it does business by building partnerships with organizations who share its desire to affect positive change. In celebration of National Philanthropy Day, here are a few ways Goldcorp's Canadian employees are making a difference in local communities. 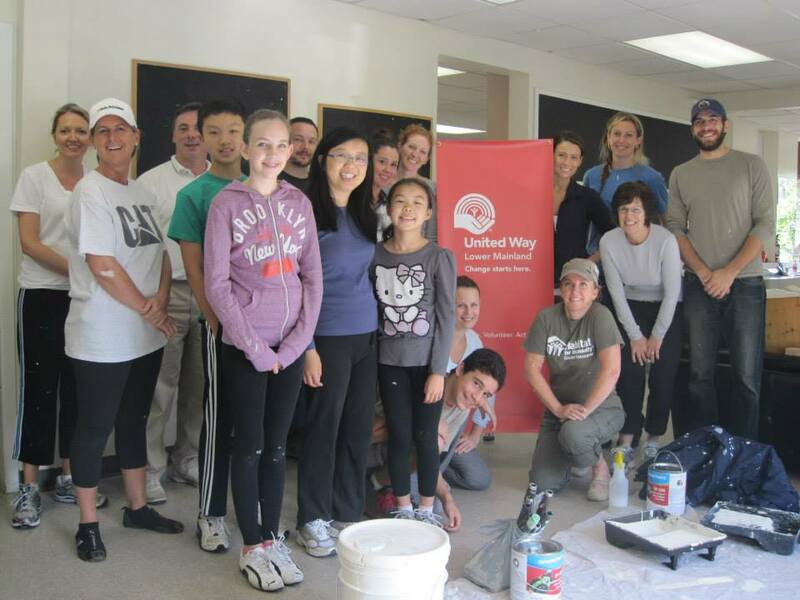 Goldcorp employees sprung to action on their 'Day of Caring' where volunteers helped repaint the inside of The North Shore Neighbourhood House’s Lynn Valley Kids Club in British Columbia, a before/after school day care program supported by the United Way. Goldcorp is a proud corporate sponsor of the United Way. For over 75 years, the United Way has helped people in the Lower Mainland, supporting children, seniors, immigrants or those at risk of homelessness. United Way takes a planned and researched approach to investing resources in our community. A crew of 15 Goldcorp employees from the Vancouver office had their hats on, hammers in hand ready to build a better future for six families in the Burnaby community through a Habitat for Humanity Build Day. Goldcorp’s Musselwhite Mine was the first ever corporate sponsor for Volunteer Thunder Bay, Ontario's Youth in Action (Y-ACT) program. With over forty partners including: the Alzheimer’s Society, Big Sisters and Big Brother Associations, Easter Seals, Habitat for Humanity and Thunder Bay Literacy Group, Volunteer Thunder Bay creates enthusiasm for civic engagement, provides opportunities for youth to learn teamwork and leadership skills and builds self-esteem by getting youth involved in their community. Goldcorp’s contribution not only assists with Y-ACT program’s ability to hire a Youth Coordinator but also helps with recruiting in high schools through funding promotional material as well as a youth transportation program. With help from local community partners and Goldcorp, the Timmins and Area Women in Crisis Centre (TAWC) is once again making sure such families don’t get left out in the cold on Christmas day. “We’ve been involved with the Timmins and Area Women in Crisis Centre for over 10 years ,supporting Christmas activities over that time,” said Dom Rizzuto, Human Resources Manager at Goldcorp, whose company donated $5,000 on Tuesday to kickstart the program. On Saturday September 28th, employees, friends, family, and partners of Goldcorp took to the shorelines of Vancouver's English Bay beach in support of the Great Canadian Shoreline Cleanup. In total, the crew removed 64.9 kg of shoreline litter, 27 bags of garbage and 12 bags of recyclables. Shoreline litter is a threat to all aquatic life and ecosystems – litter can leach harmful chemicals into the water, accidentally be eaten by wildlife and even entangle aquatic animals such as otters, turtles and birds. Even a plastic sandwich bag that blows off a picnic table inland can be washed down a storm drain, river, lake or stream, and be eaten by an aquatic animal. What makes this initiative so valuable is that it is more than just a program to pick up trash—participants are asked to collect valuable data about the types and amounts of litter they find along our waterways. Canuck Place Children’s Hospice became a new community partner of Goldcorp’s with the donation of $100,000 to support the hospice’s Grief and Bereavement Program. The funds will help provide the critical counseling services that support families through the pain of losing a child. Canuck Place Children’s Hospice provides a comprehensive continuum of care to over 400 children and teens with life-threatening illnesses and families throughout British Columbia. The unique program offers world-class pediatric palliative care within a home-like environment and year-round 24-hour consultation support. With caring, professional staff and over 350 volunteers, it is a place for children and families to come in their time of need. For more information, please visit www.canuckplace.org. In October 2012, Goldcorp Red Lake Gold Mines (RLGM) presented the Municipality of Red Lake a cheque in the amount of $5 million to go towards enhancement and expansion of the Red Lake Medical Clinic in Northern Ontario.This donation represented the culmination of several years of ongoing efforts of numerous stakeholders and partners to understand the dynamics of health care delivery in the Red Lake area and requirements to improve access to medical services and retention of medical professionals well into the future. "Goldcorp's highest priority is the safety and wellness of the people in communities in which we operate and this gift is consistent with that commitment," said Chris Cormier, RLGM Mine General Manager. "RLGM believes in sustainable projects that benefit the community during the life of mine and beyond. The Red Lake Medical Clinic will create just such a lasting legacy for the members of this community."